NASA astronaut Robert Behnken, STS-130 mission specialist, poses for a photo near the windows in the Cupola of the International Space Station while space shuttle Endeavour remains docked with the station. Next to him is the plaque containing Apollo 11 Moon rocks and a piece of the summit of Mt. Everest. high res (0.9 M) low res (118 K). Close up of the rocks attached inside the cupola. 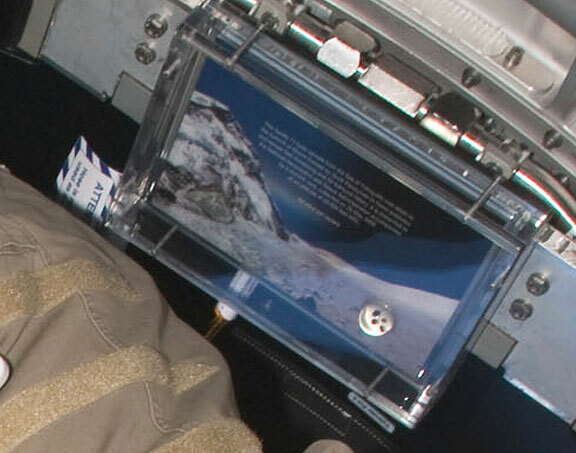 Both rocks attached to their plaque before it was put into its final, on-orbit housing. 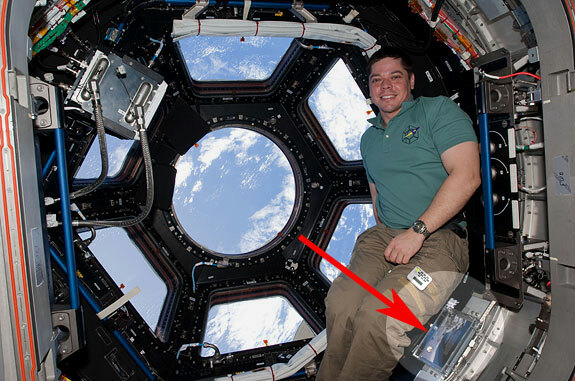 Moon rocks, collected during the historic Apollo 11 mission, found a new residence aboard the International Space Station alongside a piece of Mt. Everest. 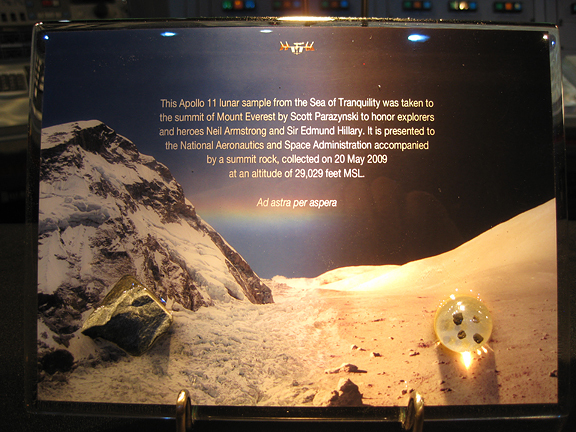 On May 20, 2009, during his second attempt to reach the highest point on Earth's continental crust, former NASA astronaut Scott Parazynski successfully carried the moon rocks with him to the summit of Mt. Everest. Part of the Himalaya range in Asia, Mt. Everest is located on the border between Sagarmatha Zone, Nepal and Tibet, China - a perilous journey for Parazynski and his team. Parazynski collected a rock from the summit of Mt. Everest to accompany the lunar samples on their journey back to space. 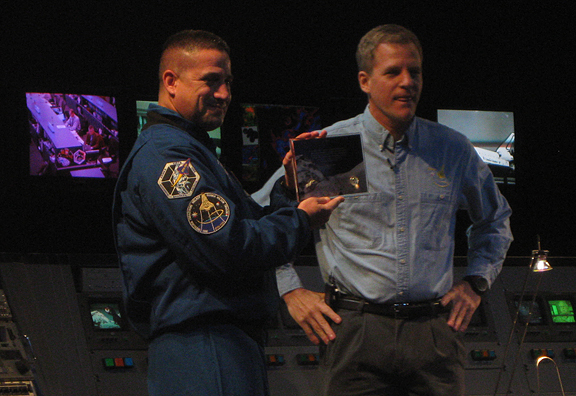 On Jan. 6, at Space Center Houston, Parazynski presented the rocks to NASA astronaut and STS-130 Commander George Zamka during a special ceremony. Zamka will deliver the rocks to the space station during Space Shuttle Endeavour's mission where they will reside in the Tranquility module, also being delivered to the station by the crew. Fittingly, the moon rocks were originally collected by former NASA astronaut Neil Armstrong from the Sea of Tranquility on the lunar surface more than four decades ago. After being presented with the moon and Earth rocks, Zamka expressed the significance of the event. "These rocks have already done more than a human being can do in a lifetime," Zamka said. "For 4 million years they were on the moon undisturbed. They got on a spaceship, traveled to Earth, went up to Mt. Everest. So in a way they have tremendous history, and now they're going to travel 17,500 mph back to space, where they will reside in the cupola of the Tranquility node." Zamka said the rocks will be a reminder to the astronauts on the space station about "what human beings can do and what our challenges are. So this is a tremendous opportunity." During the presentation, Parazynski gave a narration of his journey to the top of Mt. Everest. He explained that a part of his motivation to carry along the lunar samples was pride to have been "born in this great country of ours and growing up in the shadows of many heroes, such as John Glenn, Jacques Cousteau, Neil Armstrong and Buzz Aldrin," among others. "These are the folks who I really looked up to as a kid," Parazynski said. "It's great to grow up in a country where you can walk in the paths of these types of people. One of the things I like to do is to honor them and pay tribute to them, and that is why I took a sample of the moon with me to Mt. Everest."